Welcome to Black Dog Custom Rods (BDCR) ! New visitors: you are invited to browse through the site or choose any of the active links to go directly to your area of interest. Want to learn how to build your own rods? Returning visitors and clients: thank you for your interest and past patronage. Please proceed directly to your desired service. We look forward to being able to assist you again. Custom rod design and building – we design and build all types of fishing rods working in steel, wood, bamboo, fiberglass and graphite. We specialize in fly rods, but regularly build spey, casting, spinning and special purpose rods of all types. If you have a need or desire for a custom designed and built rod, contact us via email or the Customer Contact Form. We will work with you to create the rod, or rods, you require. Professional Angler Rods – BDCR builds rods for professional fly fishing tournament anglers, professional bass tournament anglers and professional fishing guides. Individual anglers engaged in these pursuits typically require higher quality, precision built, special purpose rods to assure success in their ventures. The same design and build techniques are used on all rods custom built for any angler to assure each new owner of a Black Dog Custom Rod uses the best possible rod available today. Private label rod building – we design and build private label rods for commercial clients. Your name and logo go on the rods created to your needs and specifications. We produce small batches and weekly or monthly production runs to match your sales and inventory requirements. Contact us via email or the Customer Contact Form to discuss your needs. Vintage rod restoration – we provide complete restoration services for your vintage rod. Antique rod restoration is often a time consuming effort as the search for original components and researching original techniques is required prior to restoring the rod. We have been fortunate in our past projects to amass a variety of reference material and contacts to aid in restoration efforts. 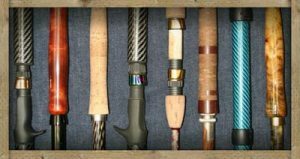 Reconditioning vintage and used rods – we do a number of reconditioning projects each year returning well used and antique rods to fishing condition. This work differs from restoration in that the goal is to return the rod to use as opposed to a complete restoration to as new condition. We may substitute the occasional component or utilize modern techniques in the reconditioning effort. Repair of broken and damaged rods – broken and damaged rods can be repaired regardless of what material they are constructed from unless the damage is simply so severe a new blank or rod section is justified. Repair costs are typically reasonable and a repaired rod continues to perform well for many years. A favorite rod or one to which you have some sentimental attachment can normally be returned to use with the proper repair(s). Our photo gallery contains examples of our various services. If we can be of assistance to you in any of these categories, please contact us via email or the Customer Contact Form. We would be happy to help determine your requirements and develop a solution with you to satisfy your needs.